​I graduated with an MFA from the University of Arts London, Wimbledon College of Arts in 2016, and have a BA in Fine Arts from the Chinese University of Hong Kong in 2010. I live and work in London. Since graduating I have shown my works in both solo and group exhibitions in the UK and Hong Kong, and my works reside in several private collections. I set out to explore the deepest levels of the human subconscious. The atmospheric, melancholic tones of my drawings and paintings evoke sensations of dislocation. These works document my interest in what is lost and what is found, the ambivalence between what is the fleeting memory and what is synthesized as a trace within the landscape. I had solo exhibitions at the Jam Factory Gallery, Oxford, Building BloQs and the Coningsby Gallery, London in 2018 respectively. I am going to have a solo exhibition in Fringe Club, Hong Kong in May and a double solo exhibition in the Chelsea Waterside Artspace, London in July 2019. Artist at the studio, 2018. Work and live in London. 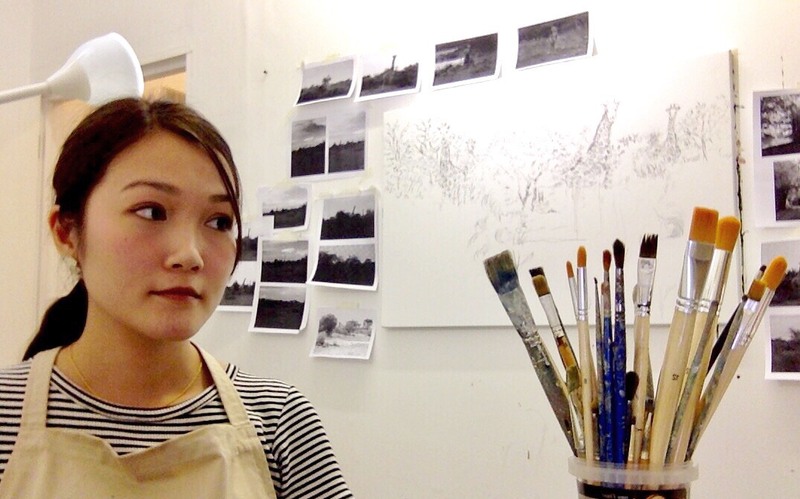 Master of Fine Arts (MFA) (Merit) at The University of Arts London, Wimbledon College of Arts, England. Worked in my studio at Fotan, Hong Kong. BA (Hons) in Fine Arts​ (Contemporary Studio Art Practice) and minored in French Studies at the Chinese University of Hong Kong. Chelsea Waterside Artspace, London, England. Anita Chan Lai-ling Gallery, Fringe Club, Hong Kong. Gallery Space, The Jam Factory, Oxford, England. Art at home, Battersea Church Road, London, England. SUARTS Chelsea Space, Chelsea College of Arts, London, England. Culture Club Gallery, G/F, 15 Elgin St.(lower), Central, Hong Kong. MY GALLERY,Shop B, G/F, Western Street, Sai Wan, Hong Kong. /04: "Creative Debuts, April First Thursday ", Creative Debuts, Black & White Building, London, England. /10: "Arkeh Art, Frieze East End Night ", Farley Macallan Hackney, London, England. /06: "Master of Fine Arts Graduation Show 2015/2016", Wimbledon College of Arts, University of Arts London, England. /03: "Wimbledon MFA class exhibition", Foyer Gallery, Wimbledon College of Arts, London, England. Gallery LVS, Seoul, South Korea. Kentish Town Health Centre, London, England. St Pancras Crypt Gallery, London, England. Chuen Lung Village, Tsuen Wan, Hong Kong. Comix Home Base, Hong Kong Art Centre, Hong Kong. Gallery Z, Jockey Club Creative Arts Centre, Hong Kong. Menior Gallery, London Bridge, London, England. 2/F, Wimbledon College of Arts, London, England. The Lethaby Gallery, Central Saint Martins, London, England. Camberwell College of Arts, London, England. /10:"The Chinese University of Hong Kong 50th Anniversary Alumni Art Exhibition"
/05:The Sketchbook Project - Mysterious Maps"
Brooklyn Art Library, Now York, U.S.A. Final Year Award 2015/16, University of Arts London, England. Best Creativity Prize of the film "Ghostless Horror", Hong Kong Fresh Wave 2014 – International Short Film Festival. Special prize of Excellence of the film "David",Taiwan The Ninth Screwdriver International Short Film Contest and Film Festival. Poven-Aven School of Contemporary Art Scholarship. Sir Edward Youde Memorial Prize. Excellence Award of Primary and Secondary Schools Students’ Creative Visual Arts Work 2004, Education and Manpower Bureau, Hong Kong. Had been selected to screen at the Hong Kong Fresh Wave 2014. Awarded Best Creativity Prize and Best Cinematographer of Hong Kong Fresh Wave 2014- International Short Film Festival. Had been selected to screen at the 38th Hong Kong International Film Festival 2014, Taiwan the Ninth Screwdriver International Short Film Contest and Film Festival 2014, Macau Espaco Video Festival 2013. Awarded Special Prize of Excellence of the Ninth Screwdriver International Short Film Contest and Film Festival 2014.